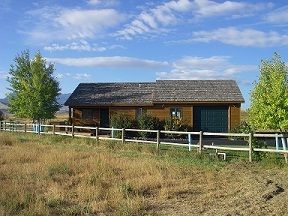 Southfork Guest Cottage is a vacation Guest Cottage rental located in the South Fork area of the Shoshone River, just six miles from town. It offers a private setting on six acres and wonderful views of Carter Mountain and the surrounding area. BLM land is just across the road. Fishing on the Buffalo Bill Reservoir and the South Fork of the Shoshone River is just a short drive away. The Cottage includes satellite TV, a full kitchen with cooking supplies, coffee maker (including coffee and tea), full bath, washer and dryer, towels, linens, and an ironing board and iron. The private bedroom has a queen log bedroom set. Sleeps up to four people with the queen sofa sleeper. The Cottage is tastefully decorated with a Country/Western theme. Outside includes a private yard and parking, deck and gas grill. Two night minimum stay. Open year-round. No Pets.